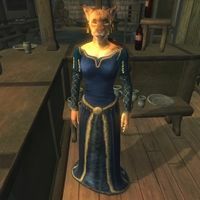 Talasma is a Khajiit publican, and the innkeeper at The Oak and Crosier in Chorrol. She sells food and rents out beds. Talasma wakes up every day at 6am and stands behind the counter, occasionally talking to the regulars until 2am, when she goes to bed. She defines The Oak and Crosier as the inn for the more sophisticated customer, and she has the wardrobe to prove it: a blue velvet outfit and a pair of gold trimmed shoes. She also carries her key and a considerable amount of gold. When you approach her, she will introduce herself and her establishment in a rather formal tone: "Welcome to the Oak and Crosier. This one is Talasma, your hostess. Our rooms and food are at your disposal." And when you ask her about Chorrol, she will compare her inn with the competing Grey Mare in the southern part of town: "The Oak and Crosier is the place of choice for well-bred visitors to Chorrol. The Grey Mare is more suitable for… others." The citizens of Chorrol have noticed Talasma’s attitude and are not particularly impressed: "The Oak and Crosier is a nice place, but that Talasma seems rather stuck-up to me." Esta página foi modificada pela última vez à(s) 18h14min de 24 de abril de 2013.